For most American families, Thanksgiving is a time to gather with loved ones, eat delicious food, and perhaps watch some football. But not everyone is pleased with the celebration of this holiday, and some have taken to maligning its “originators,” the Pilgrims. “Debunking” the nature and origin of Thanksgiving seems to be turning into its own cottage industry. But the Pilgrim Thanksgiving story is based on real events. The small band of religious dissenters who crossed an ocean to a dangerous new world have, rightly, been given special prominence in the origin story of the United States. 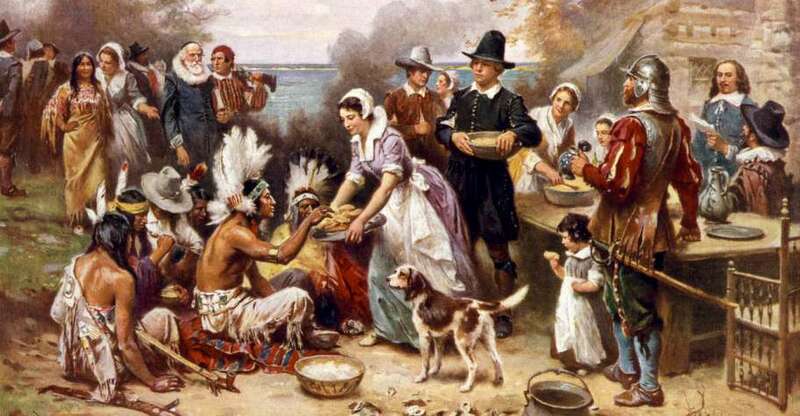 The Pilgrims were not the first Europeans to hold a thanksgiving event in the New World—although they appear to have been the first to do so in New England … It was the Pilgrims of Plymouth, however, who would be credited with establishing America’s distinctive Thanksgiving holiday—thanks to a joyful observance sometime in the autumn of 1621. The Pilgrims gathered for a three-day feast with about 90 local Wampanoag Indians to celebrate a bountiful harvest following a year of toil (over half of the Pilgrims had died since they set out for America in 1620). Though the food on the menu excluded modern items like pumpkin pie and cranberry sauce, those who gathered for that Thanksgiving likely ate wild turkey, among other foods common in the area like venison and shellfish. Happy Thanksgiving To Our Deployed Servicemen! Modern Art Is A Symptom Of Leftist Degeneracy.. OH!!! She Almost Made It Too! !